In cells, proteins tightly package the long thread of DNA into pearl necklace-like complexes known as chromatin. Scientists at EPFL show for the first time how chromatin moves, answering longstanding questions about how its structure helps regulate gene expression. The study is published in Nature Communications. The total length of DNA inside a cell is between 2-3 meters. In order to fit inside cells, DNA is wrapped around small protein spindles, forming strings of molecules called nucleosomes. The nucleosomes then coil up to form intertwined fibers. This complex is called chromatin and it organizes and compacts DNA inside the cell's nucleus, but it also makes it hard for the cellular machinery to access DNA. Structural studies of chromatin so far have only given us a static view of how DNA is organized in cells. But how can the gene-expression machinery access the DNA buried in chromatin? Answering this requires a more dynamic view of genetic material. 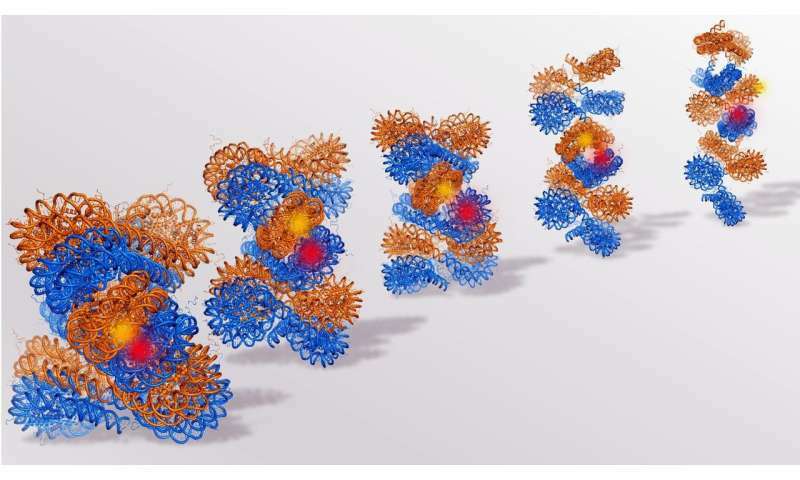 The lab of Beat Fierz at EPFL, in collaboration with the group of Claus Seidel at the University of Düsseldorf, was now able to observe actual chromatin motions, using a unique combination of protein and DNA chemistry, along with two complementary single-molecule fluorescence spectroscopy approaches. The work reveals, for the first time, the internal structure and movements of chromatin, thereby addressing an unsolved question in chromatin research. The researchers found that the nucleosomes within chromatin fibers form short stacks that quickly fall apart and reform within a matter of milliseconds. These short nucleosome packages contain four nucleosomes and about 800 base pairs of DNA, thus forming the basic unit of chromatin organization. A protein that is responsible for gene silencing (heterochromatin protein 1α), can lock nucleosome interactions and compact chromatin even more, thereby preventing the gene expression machinery to access the DNA. Together, the discovery of such rapid dynamic modes within chromatin fibers provides new insight how processes can gain access to the DNA (or are prevented to do so), such as transcription factors, or the machinery for transcription, replication or DNA repair.